"I don't have time to eat healthy." "This week is really busy. I'll have to try to eat better next week." "Someday when I'm less busy, I'll eat better." "That (healthy thing) takes too long to cook." It's time to throw those excuses out the window! Check out the interview in this month's, Harvard Health Letter with Kathy McManus, Director of the Department of Nutrition at Brigham and Women's Hospital in Boston and me about our Tips for Eating Healthy On the Go. If you feel inspired by the "Try a Smoothie" section, here is one of my favorite smoothie recipes. It's a great meal replacement or workout recovery drink. 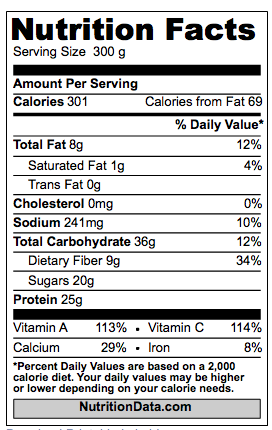 In addition to the nutrition information shown below, this smoothie contains 5 times the recommended minimum intake of omega-3 fatty acids! 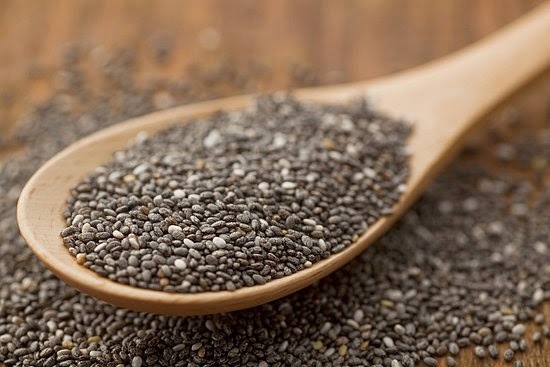 This is due largely to the chia seeds, which are one of the richest sources of omega-3s. Chia seeds have nearly 9 times the omega-3s by weight that salmon does! 1. Blend soy milk and chia seeds until chia seeds are pulverized and the mixture appears a white with a bunch of black specks. This only takes a few seconds in a commercial blender, but takes 1-2 minutes in a common household blender. 2. Add remaining ingredients and blend until smooth. 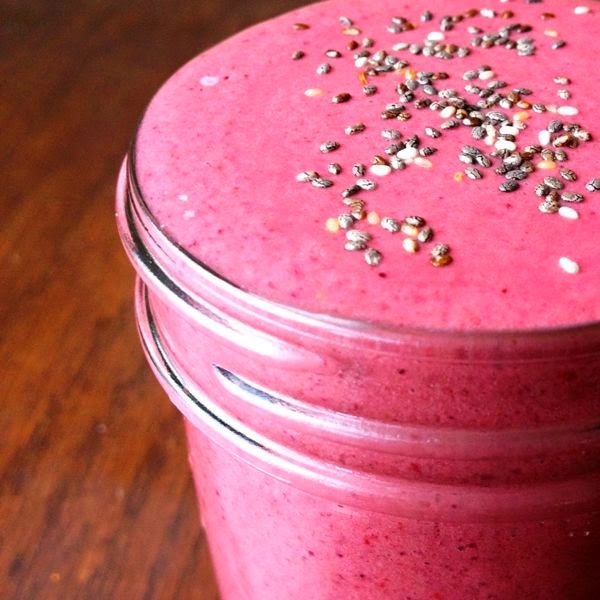 Add enough water to blend and make the smoothie the thickness and consistency you want. Sweeten to taste. I use 1 Tablespoons sweetener, but many people like it a bit sweeter. 3. Pour and serve. As long as you're OK eating this with a spoon, you can keep it for up to a day in the refrigerator. The chia seeds soak up a lot of the liquid if left to sit. *If you use Splenda or other non-calorie sweetener, subtract 8g of carbohydrates and 32 calories per serving from the nutrition facts above (i.e. 28g carbs, still 9g fiber, and 269 calories per serving).